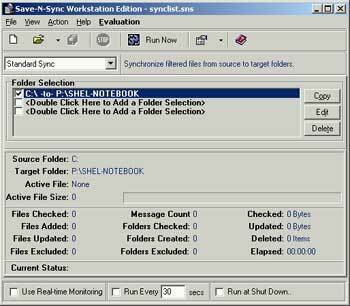 Peer Software's Save-N-Sync simplifies a tedious task. The hard drive in my notebook makes an all too unsettling sound from time to time. It's just about my only reminder to back up critical files on my notebook—and I do need reminders! Unfortunately, it often happens when I'm not in my office or when I don't have my USB hard drive handy. In my case, I have a server that I can back up my files onto—or, more precisely, I have an offline copy of one of the network shares. That means I have relative assurance that my files will be backed up to the server the next time I connect. However, setting up and maintaining offline files is more difficult than what most users will tolerate, and it only works if you have a server you can connect to occasionally. What about those remote sales people who don't ever connect directly to the office? Peer Software's Save-N-Sync software answers the questions of complexity and server connectivity. Setting up Save-N-Sync requires a few straightforward steps. It also allows you to make a synchronized copy to local media, meaning that you don't need to have the server around. Save-N-Sync can be run at startup shutdown or on demand. The desktop version can run at timed intervals, and the workstation version can even perform real-time monitoring. The upshot of this is that the application can remember to run for you—you don't have to rely on your memory. Setting up Save-N-Sync is a snap. Once you register your version of the software, you're prompted to enter the source and target directories to be synchronized. The target can be any drive the computer can see, including both network drives and attached storage. In my case, a USB-attached hard drive worked wonders. Once the folder is selected you can add additional folders or change the way the synchronization occurs. The standard and desktop versions can only synchronize one directory, but the workstation product can synchronize three directories. The corporate product can synchronize five. If you keep all of your files in one directory structure you can synchronize that root folder and Save-N-Sync will automatically re-create the directory structure for you. When that isn't possible, you can use the more expensive versions to allow you to synchronize more directories. Once you've selected the directories, you select the type of synchronization. By default, a standard synchronization is selected. This copies all the files from the source directory to the target directory. Other options allow you to synchronize all files between the source and target directories; copy the files in the source to the target and delete the files in the target that aren't in the source; or make the target match the source, even if it causes newer files to be overwritten. In the case of a backup, you can stick with the standard synchronization or select "replicate source to target" to automatically delete files in the target that are deleted in the source. Once the settings are in place, click Run Now and the synchronization starts. The status is displayed in the lower half of the dialog; if any errors are encountered, such as files being in use, they pop up in a separate window. Typically, these errors are the result of another program having a lock on the file, preventing it from being copied. You'll get the best results if you close all programs before you start the synchronization—this won't be a problem if you ultimately decide to run the synchronization at shutdown. In addition to the user interface and the ability to run the program at startup or shutdown, the activities can be scripted. If there's something that you just can't do with the user interface and you need to piece together a few other steps, you can script Save-N-Sync to perform the synchronization process for you in the middle of a more complex process. Take, for example, the notebook that has a SQL database installed. You can't synchronize the database file itself; however, you can run a backup of the database to a file and place it within the directories to be synchronized. Therefore, you can create a script that first backs up the database into a file in the synchronized directories then runs Save-N-Sync to copy the appropriate directories and, as a result, the database backup file. Ultimately Save-N-Sync can be the utility that helps you and your users back up notebooks or the utility that can help you with a troublesome application that doesn't want to be backed up. Robert Bogue, MCSE, has contributed to more than 100 book projects and numerous other publishing projects. Robert is a technical consultant for Crowe Chizek in Indianapolis. His latest book is Mobilize Yourself! The Microsoft Guide to Mobile Technology (is available wherever books are sold. He is also a frequent contributor to CertCities.com.